By Michael J. Dewey, Marvin Test Solutions. Beginning in the late 1960s, proprietary ATE systems were deployed by a wide range of customers for the functional test and verification of high value, mission critical products including board & box level avionics, depot level test & repair of armament and avionics electronics, and communications / satellite sub-systems. Although these test systems are now obsolete, the products (and their derivatives) originally tested on these platforms are still in use and need to be maintained. Consequently, there is an on-going need to either maintain these obsolete systems or migrate the applications and the legacy system's capabilities to a modern test platform. The paper provides an overview of how the PXI architecture, and associated instrumentation and software can provide the basis for a modern functional test platform that can effectively support both legacy ATE functionality as well as future functional test needs. All of these test systems have now been out of production for over 10 years with maintenance and repair support by the OEM unavailable. For those products still in use with military customers, maintaining depot maintenance and support has become an acute problem. These products (many associated with military programs) have vastly exceeded the life expectancy and supportability of the test systems, requiring the maintainers to pursue replacement strategies. Today's test systems are based on standardized, card modular architectures (VXI and PXI), offering users the flexibility to reconfigure and adapt the test system for a range of applications as needed. In particular, the PXI architecture, when combined with comprehensive test program migration tools, offers the required functionality associated with these legacy platforms while providing advanced test capabilities for next generation products. A performance digital sub-system with vector rates to 20 MHz, timing per pin, and offering wide voltage swings in excess of 20 Vpp which supported 15 volt CMOS logic as well as standard TTL logic families. An integrated analog switching system supporting a hybrid pin architecture, allowing multiple analog resources to be routed to any of the tester's test pins providing an "any resource to any test pin" capability. Incorporation of combinational test capabilities, allowing one test platform to support in-circuit and functional test capabilities. Associated with this capability was the inclusion of a pin multiplexer, allowing these test systems to support large UUT I/O (>2000) configurations. Use of simulation based test program development. Teradyne's LASAR simulator was used for TPS development with L200 / L300 platforms and GenRad's HiLo simulator was used for GR2750 TPS development. Incorporation of advanced signal routing software, providing end-to-end signal routing via the matrix and multiplexing switching system. These systems also shared the characteristics of requiring significant floor space, many kilowatts of input power, and of course a high price tag. Sales prices for these systems could easily exceed $1M USD. mil-aero related products which were not accepting of in-circuit test methods, these test systems employed functional test methods almost exclusively.Consequently, replacement test solutions for these legacy platforms are focused on supporting digital and analog functional test capabilities. A digital subsystem that has equal or better capability compared to the legacy system. And unlike the legacy systems, today's digital test systems offer both high performance and wide voltage programming ranges, eliminating the need for multiple test system configurations with different pin or channel board configurations. Analog and digital test capability on each tester I/O pin, allowing each pin to support analog of digital test capability. Retaining this capability vastly simplifies the test program upgrade / re-host process since all tester I/O pins offer the same test capability. Additionally, a hybrid pin architecture facilitates re-use of existing test fixtures (if required). A performance analog switching matrix and associated software for managing end to end routing of signals, allowing multiple analog test resources to be routed to any of the tester's I/O pins (any resource to any pin). An optional pin multiplexing capability which is integrated with the analog switching matrix, allowing the test system to support high I/O count boards or multiple ITA configurations. A modular, open architecture which allows the system to be expanded or reconfigured based on evolving or changing test requirements - a significant benefit when compared to the legacy ATE systems which were based on a closed and inflexible architecture. Software tools to facilitate TPS conversion and specifically, digital test language and digital vector conversion. Today's functional test platforms are largely based on the card modular architectures of VXI and PXI with PXI being the dominant card modular standard. With over 50 vendors and 1500+ products, its compact footprint and high functional density, the PXI platform is ideally suited for addressing the requirements associated with legacy test systems. 50 MHz vector rate with timing per pin, multiple time sets and a flexible sequencer. Compact footprint, offering 32 channels per module and supporting up to 528 channels within a single digital chassis. A wide programmable drive / sense voltage range with per pin programmability - providing the flexibility to support a wide range of applications and legacy test system configurations. All other pin resources - slew rate, termination etc. are programmable on a pin basis, maximizing flexibility for test program migration. Hybrid pin capability - providing the ability for each channel to support analog or digital test capability. Advanced power management capability, resulting in significant reductions in power dissipation and consumption compared to other digital subsystem architectures. Today's functional test systems and digital subsystems can address the legacy test needs of these proprietary systems using PXI components, which offers a reduction in form factor and test system footprint. Besides offering high performance digital test capabilities, these subsystems support hybrid pin capability - preserving the "any resource to any pin" architecture - a hallmark and key feature of the legacy test systems. 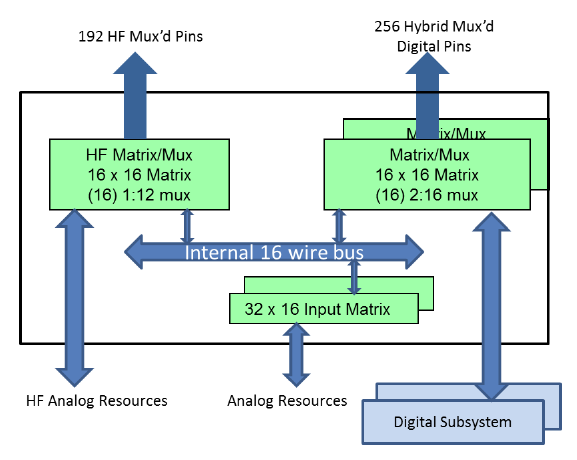 Modular and expandable analog matrix supporting an internal 16 wire bus for routing analog instrumentation and triggers from an instrument source to the receiver interface. A matrix architecture that can support a large number ( > 16) signal inputs, outputs, and triggers. A modular architecture that can preserve an overall signal bandwidth of > 10 MHz with dedicated switching cards offering > 100 MHz of bandwidth. The ability to support a multiplexed pin configuration. As noted previously, legacy testers were designed to support a full range test methods including in-circuit test methods which invariably involved the use of pin multiplexing. And while not common, functional test applications could also have employed the pin multiplexing capability. In particular, the L300 platform offered several different channel cards with different multiplexing configurations. PXI-based test systems offer this same capability and effectively address both L300 and GX2750 multiplexing capabilities. Figure 4 details the overall switching and digital resource configuration for a legacy replacement system which is modular and configurable. The key components of this system include a modular "input matrix" subsystem, an internal 16 wire bus, and integrated "matrix / mux" switch card which supports both matrix and multiplexing functions. As an alternative the matrix/mux card, the system can employ a non-muxed version, for those system configurations that do not require multiplexed pins. For high bandwidth applications (> 100 MHz) the architecture supports an HF switch card as shown in Figure 4. This card offers matrix / multiplexing capabilities for high frequency applications as well as the ability to still connect to the internal 16 wire bus if required. The result is a switching architecture that offers outstanding signal routing flexibility while preserving signal integrity. 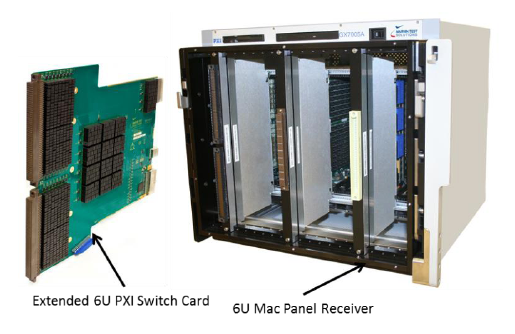 Both the matrix/mux card and the HF switch card are "extended" 6U PXI cards which utilize the J5 cPCI connector for access to the 16 wire bus, as well as offering a direct, wireless connection to a 6U Mac Panel Scout receiver. The result is an overall switching subsystem that is compact, modular, and reliable since a large number of wired connections are eliminated by employing the Scout receiver. Additionally the receiver can support over 8000 connections, providing adequate I/O support for multiplexed system configurations. Overall control of the switching subsystem is provided by system level, signal routing software. This software provides end to end to signal routing, from a tester resource to a specific UUT node and removes the complexity of having to explicitly identify a signal path and the associated relays. Additionally, the routing software identifies signal routing conflicts and protects the overall switching system from user created routing errors which could damage the system and relays. A key component associated with replacing a legacy ATE system is the requirement for software tools that can facilitate test program migration. In most cases, these tools are focused on migrating the digital test aspects of the test programs. Additionally, the tools need to provide support for both simulation-based functional test programs as well as manually generated test programs. The analog portion of these test programs are relatively easy to migrate with conversion being facilitated by the creation simple parsing / scripting routines. Teradyne's LASAR product was a popular simulation tool that was used to develop functional test programs. Commercial tools are available today that allow users to migrate LASAR based programs by using the .TAP files that were originally developed for the UUT. Alternatively, software tools are available that can facilitate the migration of manually generated digital test programs. 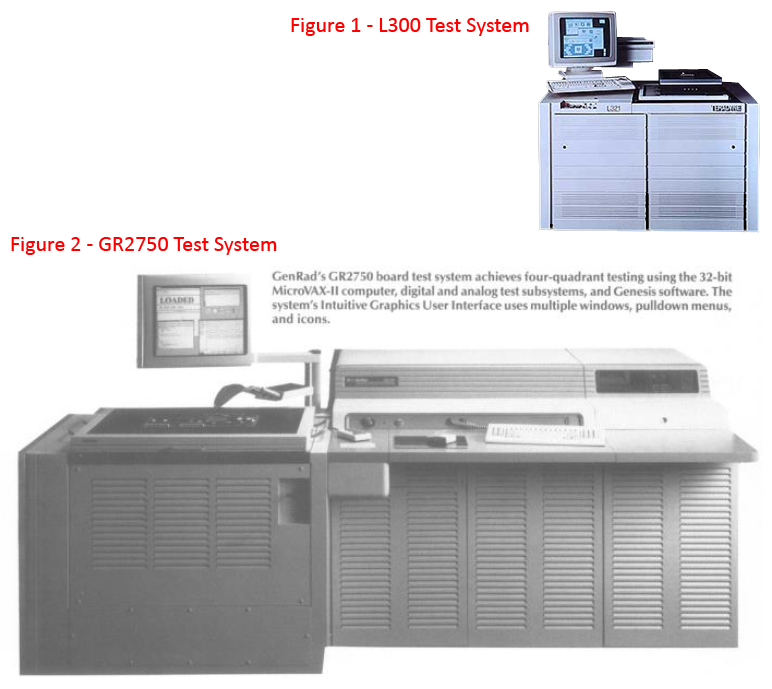 For example, Marvin Test Solutions offers an L200 / L300 software driver as part of its GENASYS platform which allows for a straight forward conversion of L200 / L300 digital test code and vectors. Converting test programs from legacy test platforms requires a range of software tools. No one conversion methodology will address all scenarios. Consequently, having a range of software tools and methodologies is needed when converting legacy test programs. 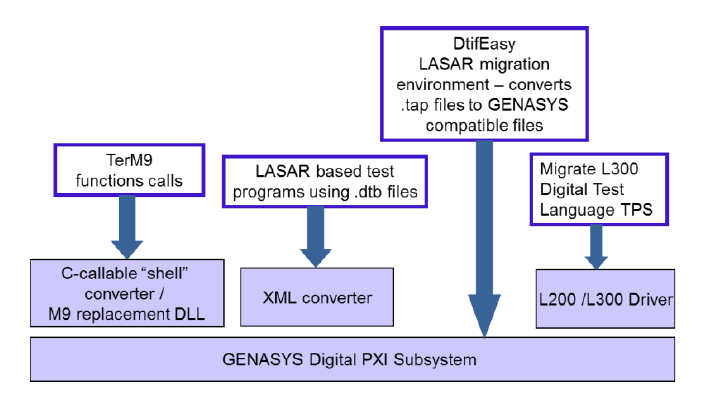 As shown in Figure 6, various options are available for converting L200 / L300 digital test programs to a PXI platform. For suppliers of electronic assemblies / systems and users that are required to maintain and support products that have exceptionally long life cycles, the requirement to upgrade or replace legacy test systems cannot be ignored. Historically, users have resisted replacing obsolete test platforms due to uncertainty, costs, and the time associated with these tasks. However, today's PXI products, software and systems now offer users the ability to upgrade legacy test applications and systems. These products offer the flexibility configurability, and a compact footprint which has wide applicability for both factory and depot applications - solving the functional test obsolescence challenge.